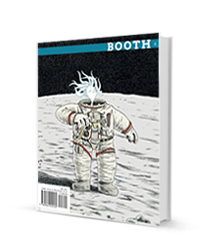 The Vouched Indianapolis table returned to its book-slinging duties this past Friday for the area’s monthly First Friday Art Walk, and the table had a top-notch journal addition: the latest from Booth, Butler’s lit mag. As I’ve come to expect from this crew, this new one soars out every piece to create one stellar literary robot–crisp, thoughtful design (this blue that flows through the issue, bordering pieces, illuminating excerpts, making the titles pop), a variety of types of printable art (your poetry, fiction, and essays, of course, but also also also stellar comics, drawings and new pieces to their ongoing Winesburg, Indiana series), and the turned-up quality of this work. See: the poems by the magazine’s 2012 Poetry Prize winner (selected by Linda Gregg), Aubrey Ryan. And there, there I am on my paint can stool, an egg, looking over Bart’s soft cotton shoulder. I am in profile, depicted as some antique muse, attempting to sketch the artist’s, Bart’s, own profile I alone can see. It seems I am whispering into his ear, a flash of a pearl-pink tongue, a kind of spark between the synapses, rendered between my lips. Still wet, the image glistens. I dismantle all my lenses and glasses and goggles. I lean into the point of paint, the picture closing in on me. Cookie Monster doesn’t need to keep up appearances or save face. Though his eyes meander and bounce, his gaze is subtly fixed on what he wants. His spherical eyes sit like two dense stars above his dark ellipse of a mouth, and all of it with its gravity pulling everyone to love him. It pulls everyone into forgetting how differently they see the eyes of puppets and the eyes of people. And this is just some snippets! Seriously, the whole thing bumps WOW. I’m putting it on my coffee table now. Michael Martone is another of those illustrious people I’ve long heard the name of from so many who’ve known him, studied under him, saw him read, etc., and who I can’t be more excited to welcome to the Vouched Presents pulpit. His quirk and wit are renown on the reading circuits, and if you had any hesitations about coming to tonight’s reading, I hope this interview settles it for you (because it’s the last Awful Interview before tonight!). See you at Vouched Presents tonight! You seem to have a real love affair with the state of Indiana. What’s your connection to this glorious state? I have to ask: could you write our readers a poem-on-demand right now about Indiana? Well, I could but I need a few things first. I need a subject. I could write one on Indiana, I suppose, but the whole exercise of the RKO Poets–a group I co-founded in the 70’s at IU–was to write an instant PERSONAL poem. Also it costs 25 cents. Our slogan was: A poem must not mean but be 25 cents. So if you want one, let’s see the cold hard cash. I can give you that. How about bibliophilia as a subject, and are you willing to extend me a quarter’s worth of credit until the reading? That’s fantastic. I think I’m going to read that on Tuesday as part of your intro. Which, speaking of Tuesday, the reading is to celebrate new books, and you have a new book. Tell us about that. It is called Four for a Quarter and it is a collection of 44 fictions about things that have to do with 4–the four winds, the four seasons, the four chambers of the heart, 4H club, four blood types, Mount Rushmore, the Fantastic Four, etc. That’s an excellent premise. Maybe a bit dated, as those machines are still around, but now it’s 4 photos for a couple dollars or something crazy. Definitely not just a quarter anymore. I actually used to love those photo strip machines, because as you can probably guess, one of my favorite movies as a kid was Karate Kid, and I’ve always held the position that a date is not a date without getting in one of those photo booths and getting a strip of cute photos. Do you remember that? Did you watch Karate Kid? Yes, I did. Many movies have used the photo booth. The French film Amelie comes to mind. But romantic montage is made fir the photo booth and vice versatile. I like Ralph of KK but he is also in movie called Crossroads where the character name is Martone. And of course he is in My Cousin Vinnie! Ah yes. Crossroads. That’s the movie where Ralph played guitar against the devil, yeah? How much would you say that’s influenced your writing–playing guitar against the devil, I mean? Well, I am all for doing the work at the crossroads. My patron is not the devil but Hermes, god of thieves, of bankers, of transmission of all kinds. Hermes is the mediating hero, the confuser of categories, the breaker of boundaries that by breaking them then redraws them. The crossroads is were it’s at! With that in mind, do you have anything you’d like to say to tonights attendees, or to people considering being attendees tonight? I’ve arrived in Fountain Square and am thinking about rolling a game of duck pins! Lots of construction going on and the square shaping up! I’d say come on down. Get lost doing it. Then, get found!